May Kyawt Oo is a journalist from Myitkyina, Kachin State, Myanmar. She began her journalism career as a reporter with the Standard Time Daily Newspaper in 2013, and has worked with the Myanmar Cable Network (MCN), The Reporter journal, and the Myitmakha Media News Agency. She has also worked as a freelance journalist for Chronicle (Mawkun) Magazine, Pyi Thu Khit Journal and The Standard Time Daily News, publishing news and feature stories on issues related to labour rights, human trafficking and the environment. Her recent work covers news on human trafficking in Mynamar and China, and in the conflict zone of Liza, Mijayang in Kachin State, Myanmar, and has been published in Mawkun Magazine. 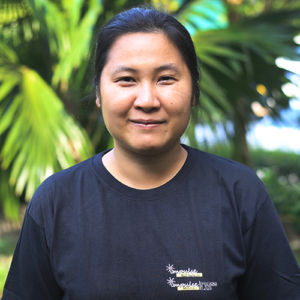 In 2018, May Kyawt Oo joined as Project Manager for the Peace and Youth Media Program of UNFPA and Burma News International, and continues to work as a freelance journalist.